Creative Program celebrating our 25th Anniversary, featuring projects from Mparntwe/Alice Springs-based artists. Curated by Kieran Finnane & Jennifer Taylor. Alex Kelly’s talk, Working Across Difference: power, privilege and the unknown unknowns. Looking at WTS’s history through objects and storytelling. Facilitated by Kelly Lee Hickey. Woodblock and interactive printing performance by Belle Moody. Performative dinner curated by Aoife Milson, Frankie Snowdon, Jonny Rowden & Zoya Godoroja-Prieckaerts. Site-specific project by Franca Barraclough. Steph Harrison and Sy Browne. Raising money for an accessible toilet. The Shits performers Alex Burgess, Beth Sometimes and Hannah Muir. 48 hours of intensive collaboration. Facilitated by Frankie Snowdon & Madeleine Krenek. Participating artists: Hannah Ekin, Jorgen Doyle, Beth Sometimes, Jonny Rowden, Zoya Godoroja-Prieckaerts, Cy Starkman and Al Bethune. Click images to enlarge. Hover over enlarged image for details. Residency in preparation for The Lost Dance Project in the WTS gallery space, 2018. Dancers/Choreographers: Frankie Snowdon, Madeleine Krenek, Benjamin Hancock and James Andrews. 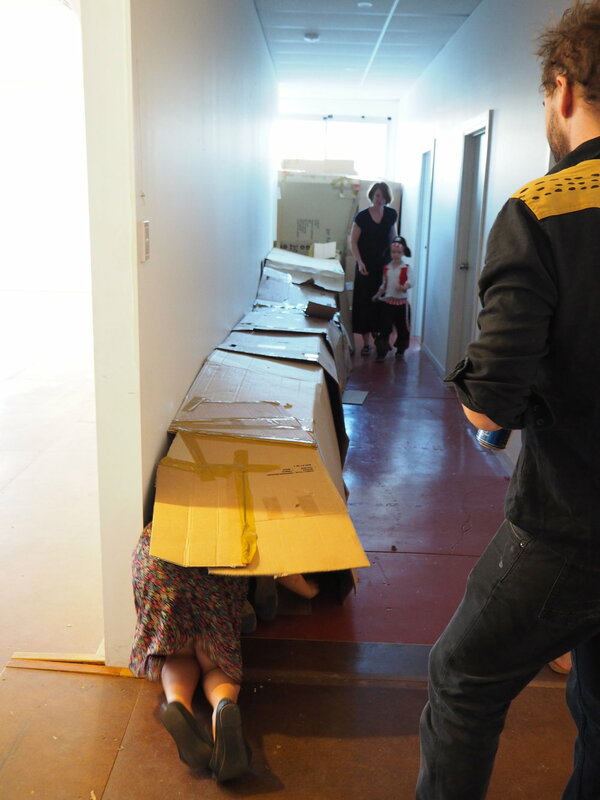 In 2018, Open Studios became a regular addition to our Travelling Artists in Residence program, allowing artists to receive feedback and engage in critical discourses about their work without the pressure of presenting a polished exhibition. 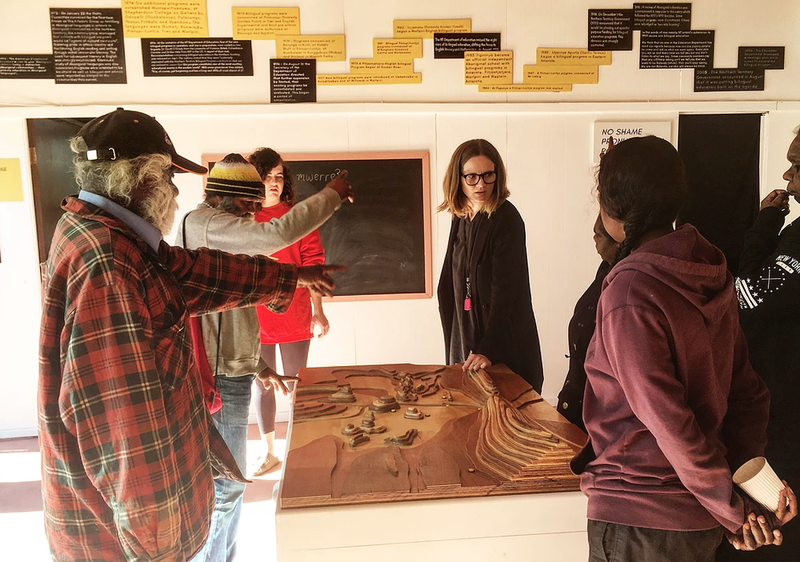 The project valued Central/Eastern Arrernte as the first language of Mparntwe/Alice Springs. As defined by Arrernte language custodians, Apmere angkentye-kenhe (A Place For Language) made various resources and events to vitalise language knowledge transfer within Arrernte families and with a broader public. Yipirinya Primary School worked with WTS to create environmentally-aware drawings for the WTS and Arid Lands Environment exhibition, 60,000 Artists, raising funds for climate change. Magic Hour @ Coles Carpark by Beth Sometimes, Zoya Godoroja-Prieckaerts & Harry Hayes, presented at Kickstart Arts Centre, Hobart, for HOBIENNALE 2017.